Introduced by Logan Graphic Products, the FoamWerks line of foam board tools allow anyone to cut foam board and cell foam easily and precisely. FoamWerks tools are accurate, easy to use, and able to cut circles, straight edges, beveled edges, V-grooves, small holes, freestyle shapes, and rabbet edges. They’re perfect for framing, architectural and room models, signs, craft projects, home décor, school projects, and much more. All of the cutters feature ergonomic designs and quick-change blades. 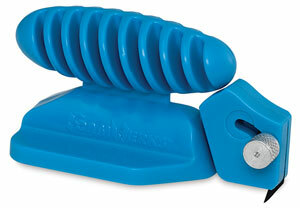 Cut freeform shapes with this innovative push-style cutter. It's easy to use — just insert the blade into the board and push to follow the desired shape. It features an ergonomic handle, on-board blade storage compartment, a blade safety shield, and two blades. Replacement Blade B — Replacement blades for the FoamWerks Freestyle Cutter.